On February 6 1952, when the death of King George V1 was announced, I had just passed my eighth birthday and was a pupil at Castle Hill Junior School, Todmorden. In those days the class sometimes took part in exercises in the school hall, to the accompaniment of a radio programme broadcast from large, wall-mounted speakers. On this day I remember the radio falling silent for some minutes, broken when an announcer came on saying "This is London" - which, even at that young age, immediately meant that something important had happened. The announcer went on to report the King's death. Just one of those occasions - like, for many, the announcement of President Kennedy's assassination - when you can remember where you were and what you were doing when the news came through. 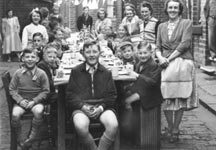 Photo BT898: Residents of Back Gordon Street and Hope Buildings, Todmorden, celebrated the Coronation in 1953 with a street party - and a right good spread! Derek Howorth, who has kindly loaned the photo, is fifth from the left.